No surprises with the packaging. As usual, the box is barely bigger than the iPhone 4S itself and has room for just the bare essentials. We found the usual charger, a USB cable and the same set of 3.5mm earphones as the one we got with the 3GS and the iPhone 4. Amidst the booklets (an iPhone 4S brochure and product guide) there are the SIM eject tool and a couple of Apple logo stickers. That’s that. We though we'd find the newly announced microUSB adapter in our European retail package, but there’s no such thing. We wonder what the EU commission has to say about it. The iPhone 4S has exactly the same size and styling as its predecessor. It's still one of the best-looking smartphones we’ve seen. The impressively slim handset measures 115.2 x 58.6 x 9.3 mm and has put on only 3 grams of weight as compared to the iPhone 4. The iPhone 4 had probably the best screen on the market in June 2010. Of course Super AMOLED’s and ClearBlack’s had a thing or two to say, but the LED-backlit IPS Retina screen had the highest resolution at 960 x 640 and eye-popping pixel density. A year later, Super AMOLED screens are making their HD debut in the Samsung Galaxy Nexus we have the first HD display on a mobile phone. That’s obviously something for the iPhone 5 to try and best but the old Retina is still among the standard-setting screens. If you’re looking for hard arguments in favor of upgrading from an iPhone 4, the display is not one of them. But the honest truth is few can match the Retina for its crisp graphics, vibrant colors, deep blacks and remarkable sunlight legibility and viewing angles. Alright, Apple may’ve raised their own bar too high with the Retina display, but we think they’ve got an even bigger worry. Improving a screen is a game of numbers. If all else fails, up the resolution. But what about something intangible and elusive like personality and good looks. They’re in for a massive challenge with the iPhone 5. And it’s all their fault. We think it’s next to impossible to repeat the iPhone 4 magic. But go ahead, prove us wrong, Apple. It’s been more than a year and we still find the iPhone 4 hard to resist. One of the most minimalist phone designs is one of the most compelling. Of course, there is a flipside. The handling is a bit tricky, so be careful at least in the beginning. The finish just doesn’t allow as secure a grip. The glass back is relatively resistant to scratches but unlikely to survive drops. The design has a weak spot - four of them actually - the corners. And the antenna issues were embarrassing, to say the least. The good thing is they’ve been sorted. In the end though, the iPhone 4S is nothing short of beautiful. Fifteen months and counting, and very few flagships have been able to come close. Let's get back to work though and put things into a more practical perspective. Although it’s virtually the same design, some of the old iPhone 4 accessories won’t fit the 4S. The Mute button is the reason, it’s slightly offset compared to the iPhone 4, but it’s just the same as on the iPhone 4 for Verizon. Let’s have a closer look at the iPhone 4S then shall, we? There is nothing surprising at the front. The VGA back facing camera and the earpiece are above the screen, with hidden proximity and ambient light sensors in the vicinity, The round Home button is below the display doing its usual job of closing apps and opening the multi-tasking bar. It now launches the Siri virtual assistant too. The left side of the Apple iPhone 4S has the usual Ring/Silent switch and the two round volume control knobs. In iOS 5 the volume up key doubles as a camera shutter too. This part of the iPhone 4S is the main reason your old case may not fit – the Mute key has been moved a few millimeters down, the volume keys have moved a millimeter too. We guess the new antenna design might have something to do with that. On the right side is the microSIM card slot. To open it you'll need the enclosed SIM eject tool. A paper clip or a pin would do too. The top is where the Sleep/Wake button is, as well as the standard 3.5mm audio jack. There is an extra mic too used for the active noise cancelation. The iPhone 4S has the proprietary Apple USB cable/charger/dock connector at the bottom, as well as a tiny loudspeaker grill and mouthpiece either side of the connectivity port. No stereo speakers, yet again. The rear features the 8 megapixel camera lens and the single LED flash. The iPhone 4S Li-Po battery has been upgraded to 1430mAh and is non user replaceable. There is no microSD card slot either, not that we expected to see one. One last change to mention is the antenna design. Speaking of which, the bumper cases are no longer needed other than for protection. Apple learned their lesson from the iPhone 4 and while the iPhone 4S looks practically the same, it features two antennas to combat the "death grip" issue. Note that we don’t mean the dual GSM / CDMA radios. It’s actually two separate antennas, each of which support both standards. The phone can intelligently switch between the two as needed (even in the middle of a call), so if one antenna is blocked, the other takes over. This means no death grip, no matter how you hold the iPhone 4S. Unfortunately, the SAR values have gone up and are twice as high on the iPhone 4S. Those are still within the accepted standards for these sorts of things, but it’s something that’s worth noting. What we know for sure is the iOS 5 is not skimping on the upgrades. A beautiful phone has just become better and faster. Twice faster at times, which was really impressive. The iPhone 4 is nowhere near sluggish but it’s good to know you have the extra torque when needed. 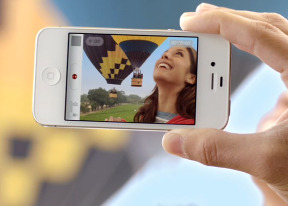 And last but not least, the iPhone 4S finally makes the A-list with 8MP stills and Full HD videos. We’ve got a dual-core smartphone and a full fledged cameraphone waiting in the lab. Let’s not keep it idle.